In the Time Before Quilting, I had tried almost every other needlecraft available--needlepoint, counted cross stitch, knitting, crocheting...you name it, I probably tried it. Then, along came quilting...and the rest, as they say, is history. For twenty years, all I have done is quilt, as both recreation and as vocation. I had seen many quilters and others knitting. I felt the urge--but felt I didn't have time to knit. So I said no to knitting for about three years. Then, just before Christmas last year (Friday, December 21, at 3:00 p.m. to be exact) I found a dishcloth book with a ladybug design in it. It literally caught my eye as I was flying through the knitting department on my way to somewhere else. I hemmed and I hawed. Because I have a friend who collects ladybugs I finally decided to get the book and the yarn (I had kept my needles). I was SURE that I could knit just the one dishcloth and then quit knitting. Well, between December 21 at 3:00 pm and Christmas day, I had knit 9 of the 12 designs in the book. From there I made my mom two scarves in seed stitch (k1 p1), on 40 stitches, one 50 inches long and one 80 inches long. I made at least 10 fun fur boas. And at last count I had done about 30 dishcloths! I also made two hats (one with cables), 2 neck gaiters, 3 baby hats, baby mittens and probably some stuff I've forgotten about already! I finally got used to using circular needles. Some of the people in my quilting classes are knitters and have been knitting socks--lots of socks, with patterns to make you drool. I said that I couldn't see myself ever knitting socks--especially with those dreaded Double Points. Then someone was using two circulars and then someone else said something about Magic Loop. I decided that knitting on one circular made more sense to me, since I had just mastered that. So I got the Magic Loop book and a size 1 40 inch circular needle and played with it. Then came the fateful day when I bought my first skein of Sockotta yarn and cast on my first sock. I truly figured I would get the cuff done and that would be the end of my sock knitting. But, on Sunday night I finished my first sock--except for the toe grafting--I can't quite get the hang of that. And my second sock (of the first pair) is cast on and I have about 1.5 inches of the cuff done! Socks are easy! Who knew? And addicting--but at least sock yarn is comparatively inexpensive. Where else can you get hours of entertainment for under $10? When I told someone that I had paid about $10 for a skein of sock yarn they asked how many socks I could get out of it. When I told them just one pair, their eyebrows shot up and they said $10 for ONE pair of socks? I didn't dare tell them about the hand-dyed sock yarn I got on my trip to Florida--$20 for one pair! TA DA: here's the first sock! 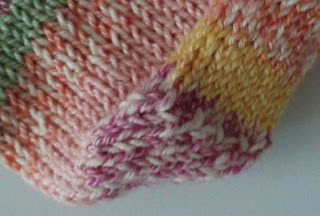 I wish I could take credit for the wonderful way the heel turned with the colors aligned--alas, it was the yarn! Now, for those who are wondering if this will turn into a knitting blog--the answer is no. Although knitting might creep in from time to time! The reason that I'm confessing now is to say that I was feeling guilty about knitting, even though I only do it in the late evening (mostly!) and I am finishing projects before moving on to the next. (Unlike my quilting, where I have over 120 unfinished projects!) 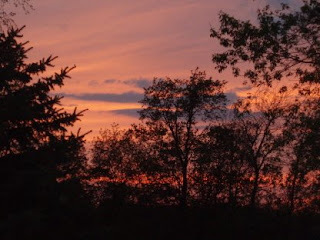 I found I can have a finished project in a shorter length of time, and I am not so emotionally invested in it (read, it's easier to give away!). I have started a chemo cap and hope to continue making those to give away. Also preemie hats for a local NICU. And, although I've been trying to rationalize my knitting, I really don't have to. Learning (or relearning) a new skill has made me feel much better about lots of things. It turned on my creativity in other areas. I am excited about something new, which is carrying over to the rest of my life. And my quilting. A giant thank you to Carol and Barb for gifting me not only with the scarf and wristers but with a desire to knit again! The last picture was taken Monday night, Memorial Day. THANK YOU to all our troops and to the families who await their safe return. Let's keep them in our prayers. On Wednesday evening, driving to class, I saw a complete rainbow! It was so unexpected and spectacular. It was visible for several minutes! It's the second one I've seen this month...I'm choosing to think of them as good omens. Awhile ago I posted a picture of the center of this hexagon. Here it is all grown up. The center hexagon measures just 1/4 inch per side, with the entire hexagon being 8 inches. I'm really liking how these are turning out. And I already have two setting ideas plus plans for some smaller projects that could be used as gifts. Remember that my mom planted tulips and crocus for me? 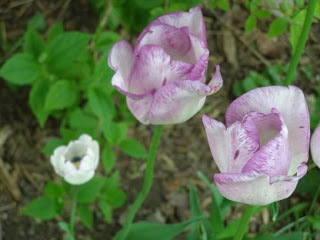 This picture shows the tulips--we both think they are very unusual. 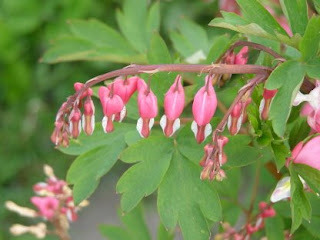 The small one, creamy white with a hint of fushia tip, is how each one comes out. 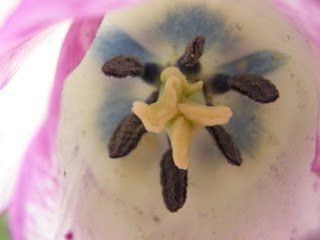 Then, as the blossoms grow bigger, the edging turns to purple and continues to flow to the bottom of the petals. We've never seen anything like it! They are so pretty and are still blossoming. And on that note, I'll bid you good night or good morning, whichever applies to you as you are reading this. Stitch whenever and wherever you can. Happy thump day plus one! Here in central New York, it is a dreary, windy, cool Monday. But I'd much rather have this than the 95 degree temps they are having on the West Coast! I finished two of the hexagon blocks and will post pictures tomorrow. I'm really excited about that project--I love the colors and fabrics and the blocks are turning out quite nicely--if I do say so myself! Until tomorrow, I leave you with more pictures of my spring flowers. They have just been amazing this year. Happy Monday! P.S. Did you remember to do some stitching today? 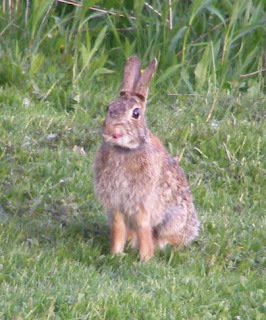 Though the temperatures at night and the bite to the wind speak otherwise, the animals and flowers have decreed that spring is here. The rabbits are having a great time running and jumping (straight up!) and generally looking like Keystone Kops! 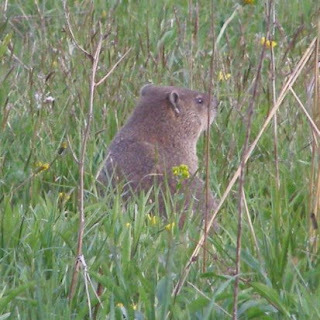 The woodchuck has dug several escape routes to my back porch. Lynnie is especially entranced with the tunnels--eau de woodchuck, no doubt! 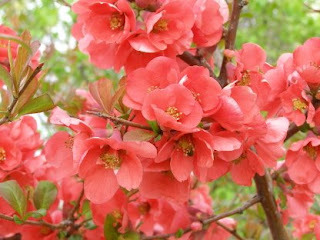 The flowering quinces have been loaded with blossoms; more than I've ever seen. 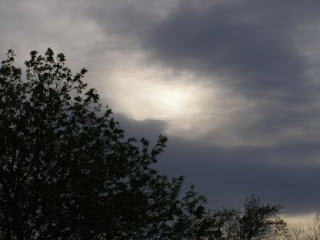 What would spring be like without some stormy skies? I love the play of light behind the trees and the cloud formations. Up close and personal with a tulip. This is one of the ones my mom planted last fall for me. 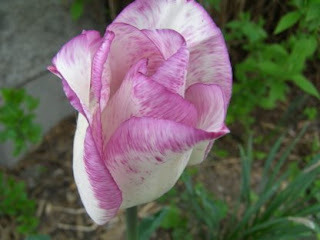 The lavendar on the edging keeps working its way down toward the bottom of the tulip. I love the blue "star" at the bottom. You can almost see the pollen spores getting ready to burst forth. 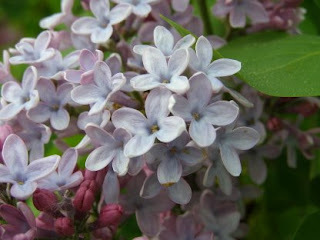 Last night after I finished mowing, I brought a bouquet of fresh lilacs into the house. They remind me of the May I got married, when the lilacs at my parents' house were the fullest and prettiest that they had ever been. The scent always reminds me of that wonderful day. I have both dark purple and white, and the air outside is redolent with their scent. And, yes, you inquiring minds, I have been quilting. 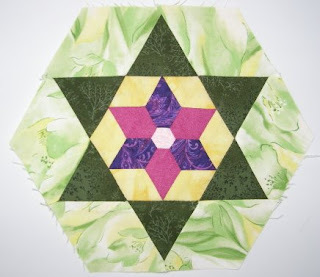 Trying a new batting, finishing some hand piecing samples, writing new handouts.... The list of "to-do's" is never ending--but still fun. Stitch a bit--you're worth it! 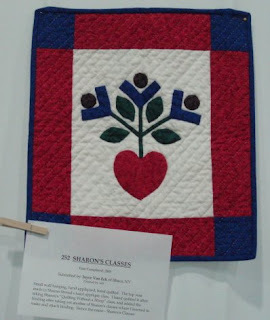 Sunday at the Cortland Quilt Show gave me a chance to walk among the quilts and to meet new people and see some familiar faces that I hadn't seen in a while. 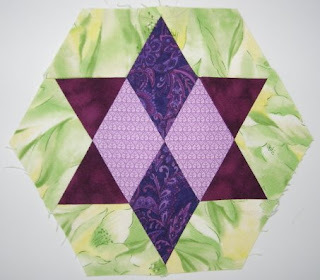 A quilter that I am totally in awe of is Ruth A. White. Below is her piece titled "Phase Shift". 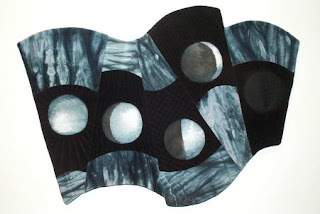 Notice the moon phases across the quilt's surface? Ruth combines the best of both worlds--true artistic vision and fantastic workmanship. Her Icicle quilt from about 4 years ago still intrigues me and is one of my favorite pieces. 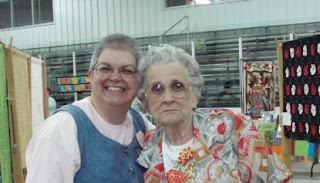 Ruth is also one of the kindest, nicest ladies I know. She's awesome! One of my former students had a piece in the show--titled "Sharon's Classes". Joyce learned to hand applique in one of my classes, learned to hand quilt on the same piece, and then bound it in another class! What a thrill to see finished projects! Way to go, Joyce! I hope your weekend was great and that the start of this week went smoothly. I'll try to get some new pics up in the next couple days. Remember to tell someone how much you appreciate them. I'm mad as h.e.doublehockeysticks! Who stole April 26 to May 2?!!? I'm beginning to feel like Rip Van Winkle--the time just flies by. Of course, the fact that I taught one 6 hour class, four 3 hour classes, revised handouts for one class, finished handouts for two new classes and have spent today vending at a local quilt show could have something to do with that! I have had two students (in separate classes and in different locations) tell me that they couldn't sleep before their classes because they were so excited! I take that as a truly great compliment! Remember the 8 inch hexagons? Here's another finished one. I'm really liking these a lot. If you are in the Cortland, New York, area this weekend, stop by the YWCA Quilt Show at the McDonald Sports Center. 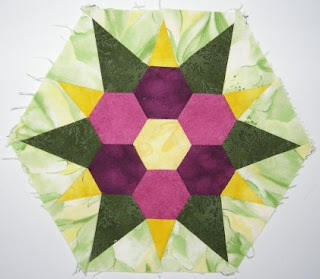 There are lots of great quilts, including all the Finger Lakes Library quilts, a fabulous raffle quilt, and vendors with a wide array of treasures. I hope to see you there! Wish me luck--this was day 4 of a 10 day stretch. Coming up: Two more days at the quilt show, and then six 3 hour classes in four days. Have a great weekend, and remember to do something nice for yourself.